It's March and we're ready to "spring" into comedy! Each Thursday night this month, we'll be showing a double feature of comedies from Columbia Pictures. We start the month with a bonus - a triple feature from comedy greats The Three Stooges. The Three Stooges started in vaudeville in the mid-1920s and were then headed by comedian Ted Healy. In fact, the act was originally called "Ted Healy and His Stooges" and many other names like it. 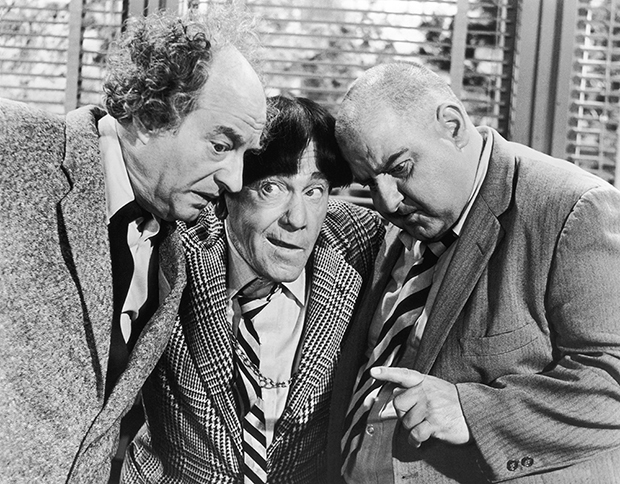 Though the group went through different members, the main Stooges were Moe Howard, his brother Shemp, and Larry Fine. In 1932, though, Shemp left the group and was replaced by younger brother Jerry (a.k.a. Curly). They were so popular with their slapstick that MGM came calling. Though an honor, The Stooges were mostly only used as comic relief in films. It was Columbia head Harry Cohn who saw their full potential and signed The Three Stooges to their own contract in 1934. With it, they made more than 190 film shorts and serials to became the success we know today. We start the month with three films from the trio in the early 1960s. In 1963's The Three Stooges Go Around The World In A Daze, Moe, Larry, and Curly Joe (Joe DeRita - who joined the team in 1958) play servants to an ancestor of Phileas Fogg and embark on a trip around the world. Of course this film plays with the original Oscar-winning movie Around The World In 80 Days. Then Moe, Larry, and Curly Joe launch into science-fiction with The Three Stooges In Orbit. In this farce from 1962, Martians are trying to steal an all-powerful submarine-tank-helicopter military weapon. After capturing this vehicle, the Martian spies go winging through space with the Stooges clinging to their side. Finally in 1965's The Outlaws Is Coming, Moe, Larry, and Curly Joe come back down to Earth and head West with a reporter (Adam West) to help save the buffalo. It should come as no surprise that The Stooges get mixed up in a battle between tough gunslingers - including Wyatt Earp, Billy the Kid, and Jesse James - and a Native American tribe.